Lutz: He had dropped the truck sale, he said, to concentrate on image and product advertising. DETROIT -- Pressed by its dealers, Chevrolet and GMC are holding fall truck sales after all, despite an earlier plan to rely on image-building advertising. The event started Friday, Sept. 25, and will end Nov. 2. 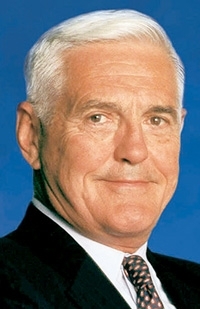 In an interview this month, marketing chief Bob Lutz said General Motors Co. had decided to drop its annual September Chevrolet truck sale even though Ford Motor Co. is holding one. Instead, GM planned to focus on its "May the Best Car Win" image and product campaign. But dealers have been clamoring for advertising to drive sales. Ford has been running its annual truck month sale since Sept. 10, with rebates up to $5,000 on pickups. Spokesman John McDonald said GM is offering 0 percent financing for 60 months for all pickups, making it an official "truck month" but mostly for advertising purposes. "This is not a corporate-wide truck month like you saw a year ago," said McDonald. "You'll see some advertising. The ads will use the words 'truck month,' but it's more of a competitive response." GM is continuing rebates and leases on various models of all four of its brands, along with the 60-day return offer. "This is good," said Tommy Brasher, owner of Brasher Motor Co. in Weimar, Texas. He sells Chevrolet and Buick. "The money on the 2010 models is a nonevent because there aren't any of them in stock," Brasher said. "The incentives are good advertising to get people in the door. Then we can sell them whatever we have in stock." In the interview this month, Lutz, vice chairman of marketing, said GM was forgoing the traditional September Chevrolet truck sale to concentrate on image and product advertising. Said Lutz: "We didn't want an on-sale event to blur the message of 'May the Best Car Win.'"